Dr. Samuel K St Clair, MD is a Doctor primarily located in Raleigh, NC. He has 32 years of experience. His specialties include Neurological Surgery. He speaks English. Dr. St Clair has received 2 awards. The overall average patient rating of Dr. Samuel K St Clair is Excellent. Dr. Samuel K St Clair has been rated by 26 patients. From those 26 patients 11 of those left a comment along with their rating. The overall rating for Dr. Samuel K St Clair is 4.5 of 5.0 stars. He was a great doctor to work with. He had to repair my L4 and L5. That was in 2014 but I havent had any problems with the pain down my hip, legs, into my feet. So glad I had this procedure! My daughter had terrible back pain for a couple of weeks with no history of any kind of pain. We had an MRI done by our PCP and I faxed the report to Dr St.Clair's office. His very efficient and kind staff member called me within an hour to bring her the same day at 4 PM. (Friday afternoon). He informed us that she needed surgery immediately for a herniated disc that had slipped over and almost completely pinched off nerves. He wanted to do this the next morning but Rex did not have an open spot for him on OR schedule. He did not let that stop him. He called the Nursing Supervisor and told her he needed the OR that night so at 9 PM on Friday night of Mothers Day weekend he takes her to surgery. She was immediately relieved of pain and numbness. He even took a great deal of time to completely connect the lines of her butterfly tattoo on her lower back so it would still look the same. The Rex staff was great and they all praised Dr St.Clair. he is absolutely the best. Staff is very friendly and helpful also. I was crippled by back pain until surgery and was relieved of it all afterwards. I am very greatful for a wonderful outcome. This man is fantastic. I had a very old, chronic L5-S1 disc herniation that had calcified (because other doctors were dragging their feet the injury could have been much more easily treated many years prior!) I had suddenly developed leg weakness and numbness and sudden, debilitating pain. I tried a new neurosurgeon suggested by a local hospital. He was rude, spent little time with me, did not even bother to see the CT scan I brought with me and suggested I see a chiropractor and scheduled an MRI almost a MONTH later! I was not happy. A co-worked suggested Dr. Samuel St Clair. I called the office and spoke with one of his receptionists (also very knowledgeable). She had me an appointment for the same week on Friday at 2:30PM. I arrive, I wait a bit, see Dr. St Clair and he spends nearly 15-20 minutes with me as I explain the past I have had and does a very thorough examination. He sits with me and goes over the CT scan I had and the doctor's report from my ER visit and says he wants me to get an MRI ASAP to see more soft tissue detail. His receptionist sits with me, get's my insurance info, validates my pre-cert and sends me to Wake Radiology for a 4PM appointment the same day! Then she asked me to come right back after my MRI, bring the disc with me and see Dr. St Clair again. I arrive back at Dr. St Clair's office at 6PM (on a Friday, mind) and he talks to me a bit more and goes over my MRI with me. He is concerned about the disc degeneration and wants the opinion of a good, conservative Spinal Orthopedic Surgeron, Dr. Mark Mikels, to make sure that a fusion would not be necessary. I see Dr. Mikels the following week and he says with the amount of remaining disc material and my age, he did not see it to be necessary. After that, Dr. St Clair's office set me up for surgery at Rex. The surgery went well. Dr. St Clair saw me before surgery, explained what was going to happen, saw me again the same day during recovery, called to check on my at about 8PM during my overnight stay and then again he saw me at 10AM the following day to check my progress. I simply could not have been more pleased. He is direct, charming, knowledgeable, and caring. He answers any questions you ask and respects your time. He is honest about possible results, risks and benefits. I never felt he was hiding anything. I never felt like I could not trust him. Simply a fantastic Neurosurgeon. I had been to several doctors in a 6 month period..steadly getting worse. Went to Triangle Orthopeditics & had nerve conduction study & MRI, That Doctor found my problem & referred me to a surgeon, I was referred to Dr St Claire & had surgery about week later at Rex. That afternoon I was walking without the constant pain & without all those crazy meds. I had 2 bulging discs, herniated disc, & pinched nerves, Thank you Dr St Claire as I had NO life except pain before & now is much much better. 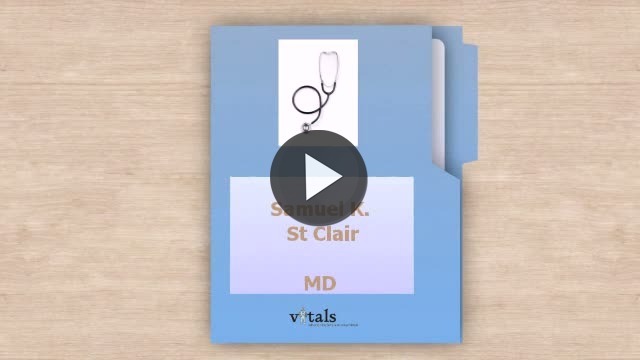 Take a minute to learn about Dr. Samuel K St Clair, MD - Neurological Surgery in Raleigh, NC, in this video. Dr. Samuel K St Clair is similar to the following 4 Doctors near Raleigh, NC. Have you had a recent visit with Dr. Samuel K St Clair? Select a star to let us know how it was.